Fuel prices have been increasing steadily for a while. Various world events, like regulations in other industries, continue to have far-reaching effects on diesel prices, and there are no signs of costs stabilization in the future. While trucking technology won’t help you lower national gas prices, it can certainly help your drivers use gas as efficiently as possible. While standard GPS systems can certainly get a driver from one location to another, top-of-the-line navigation technology creates optimized routes in real-time with multiple drop locations to maximize loaded miles. These optimizations ensure that expensive resources are not wasted and operational costs resist skyrocketing — even as gas prices continue to rise. Another widespread problem the industry is experiencing today is a driver shortage. Bloomberg attributes a 9.4% hike in long-distance trucking costs to this shortage. Whether you blame federal rules changing maximum workdays, the aging trucker population, or a low unemployment rate, the fact remains that there simply aren’t enough drivers to go around. While trucking companies could (and probably will) continue to increase driver pay to interest an uninterested population in the job, fleet management technology can optimize the drivers you do have, so you can achieve more with fewer employees. Drivers’ availability can be monitored in real-time, allowing managers to schedule the correct number of drivers rather than guessing, which more often than not leads to scheduling too many drivers at once. By ensuring you are optimizing your most valuable resources, trucking technology has an incredibly fast ROI. Discover the industry average percent of total operating cost various expenses such as fuel, driver pay, and software account for with our latest infographic. Truckers may have clear paths to follow, but operations centers can be a mess. With all the complex information and communications that office workers have to keep track of, it’s a miracle that truckers get anywhere at all. The same can be said for most businesses, which is why 60% of enterprises use data and analytics software to improve process efficiencies. Invoices, driver schedules, load data, per delivery costs, drop-off changes — the amount of information passed around a single trucking business in a single day is staggering. But each and every one of these documents is vital, so businesses have to find some way to share and store it all. Today’s technology allows you to eliminate paper run tickets and messy handwriting, then store your electronic documents in an easily accessible, centralized location where employees have access to exactly what they need. For example, drivers can print electronic run tickets in the field and immediately send load data back to your operations center for review. Automation minimizes data entry and human error, leading to much more accurate records. 71% of enterprises worldwide predict their investments in data and analytics will grow during the next three years and beyond. Big data is a huge buzzword in almost every industry — with good reason. A massive 57% of enterprises report that they rely on data for strategy creation. Access to a vast amount of detailed, relevant data allows businesses to carry out real-time analysis on current fleet tactics and gain valuable insights into their levels of success. Once you determine which of your methods are working, which are not, and which could stand improvement, you can make informed decisions about your business strategy. Real-time analysis simplifies A/B testing, too. If you’re interested in trying out a new company-wide strategy, you can implement the strategy, then quickly review results to see how the new strategy compares to your previous strategy. And because fleet technology data is hosted in the cloud, it is accessible everywhere in the world. That means that as long as they have internet, managers don’t need to lose sight of their business while they’re away learning new skills at conferences. If a traveling manager accidentally drops his or her laptop into the ocean during a conference cruise? Data stored in the cloud will not be lost. For businesses that are wary of making large investments, the SaaS subscription model is a perfect fit. When before you may have signed a long-term contract that dragged on as equipment became outdated, with current fleet management technology systems, you’re allowed to leave your contract at will; this on-demand software can be purchased month-by-month. A straightforward pricing structure allows companies to reliably plan their expenses, too. 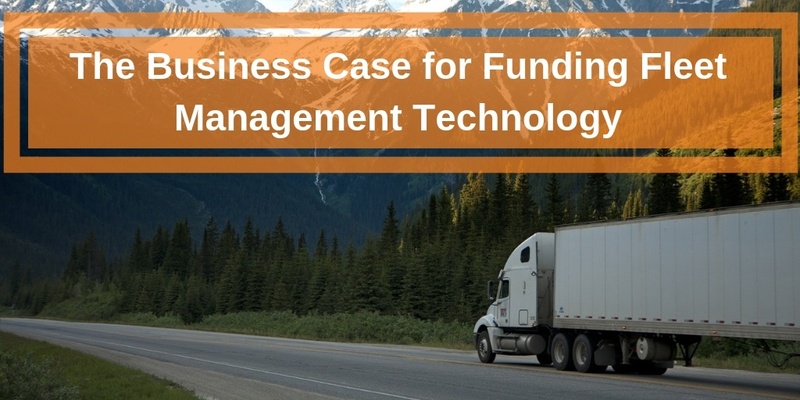 If you aren’t sure about making an investment in trucking technology, you can easily try the system for a quarter or two and examine the results. Then, you can decide if you want to continue using the software, if you want to adjust capacity, or if the subscription simply isn’t working for you. With the option to evaluate your needs and adjust your subscription monthly, fleet management technology is a risk-free choice. Ultimately, fleet management technology produces an impressive ROI. With one purchase, you’ll quickly see increased margins, more organized operations, and an improved business strategy — all under a flexible contract that you can leave if you’re not satisfied. Want to see what high-quality fleet management technology looks like? Contact us today to setup your free demo.